What a lovely pudding! That meringue topping looks stunning, Jean. Thanks, Angie! I think using lots of sugar would've made it higher, but then I couldn't have stood to eat it! Lovely banana pudding Jean. We are banana loving family. the meringue topping looks perfect. Thanks for sharing with Hearth and soul blog hop, pinning and tweeting and sharing in google plus. Swathi, thank you! And I really appreciate your sharing on social media since I'm not signed up for all that! Lindsay, I haven't tried it for risotto yet; can't wait! Sully, sounds like a brilliant plan! Oh goodness, now you've got me craving custard. That would probably be the first thing I'd try. Laurie, wonderful! Let me know how it turns out for you. I had a friend over today who turned down a dish of the pudding because she hates bananas -- how can anyone hate bananas?! The pudding looks fantastic! I can't wait to try the recipe. Thanks for a chance at the give away. I love Le Creuset! Such nice cookware! Thanks, Karenann! Hope you like it as much as we do. I make oatmeal almost everyday. Maybe this is the right pan for that. Leslie, I make oatmeal almost every day, too! I just make one bowl for myself (1/2 cup uncooked oats) in the microwave. Then later my husband makes the same amount for himself on the stove in a 1-quart saucepan. Greg, it IS a lovely pan! I haven't had a banana pudding since I left the states. I should make a clone of Nilla wafers because they aren't available here. I'm craving banana pudding like you wouldn't believe right now. Thank you, Maureen! You can probably get those crispy Italian ladyfingers (can't think of the name right now). They work great in banana pudding. Take care of that craving! Jean, you've got a splendid recipe here, liking the less sugar too! And the pan? Really nice! Brooks, thank you so much! Nicole, thanks. Hope you'll give it a try. Oh my your banana pudding took me back more years than you can imagine. Still a favorite but do not make it hardly anymore. 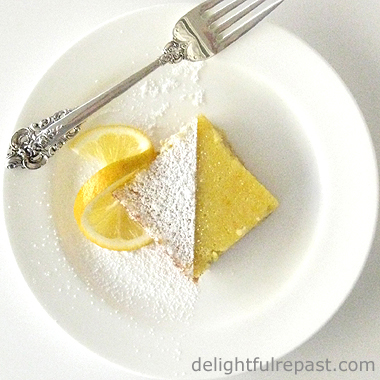 My mom was a great Southern cook and this was a family favorite desert. The first thing I would make with it would be grits and after that make that banana pudding from scatch...that is always the tastiest and best way, n'est ce pas? I now live on the West Coast but do miss much about the South; especially the good simple taste of the South. Thank the sponsor and thank you for this giveaway and thank you for taking me back in time...it was/is a delightful memory. I have no blog but love all you wonderful ladies who give us much joy. The first thing I'd make in my saucier is some Polenta. I was already following Le Creuset on Twitter, and my twitter handle is @dishofdailylife. I follow you on Twitter too...twitter handle is @dishofdailylife. :) Just shared on Facebook and will tweet for you later on too! I would make rissoto first if I had this pan. I would make this lovely recipe! Thank you for the wonderful giveaway. Erin, thanks! I think you'll like it! The first thing I would make is smothered bone-in thick pork chops with a wonderful gravy. I follow you on twitter @rusthawk. Thank you! Rusthawk, those pork chops sound like something I should be having for dinner today! I will make potato tomato dish in this lovely vessel.. I follow Le Creuset on twitter @infysamtweet. Geena, I love any dish that has potatoes in it! My hubby is a fiend for banana pudding, your recipe would of course be the first thing I'd try making. Mysweetiepiepie, "a fiend for banana pudding" -- I love that! That banana meringue looks wonderful Jean. I may persuade Marilyn to make one. As far back as I can remember, lemon meringue pies are something I could die for. A little bit of heaven!!! Have you got a recipe for one? Your home made banana pudding looks simply scrumptious! I love home made too for it always tastes best. Not only that, we know what we're eating. Thanks for the recipe. Enjoy your weekend. Tony, thanks! Yes, get Marilyn right on it! And eventually I'll get round to posting my lemon meringue pie. Sandi, thank you so much! OMGosh Jean... i haven't had Banana Pudding forever - which is a complete shame, because it's one of my favorites! I love that you make yours from scratch. It looks so good and I'm dreaming about eating it. Your pudding looks dreamy. I might use that beautiful saucier to make a classic Hollandaise Sauce. I follow An @lecreuset on Twitter where I am @AnnaZed. I follow @delightfulrepas on Twitter where I am @AnnaZed. Yes, Marguerite, love a good hollandaise! Yummy! The pudding looks too pretty to eat :) And the meringue...oh, how I love meringue! Thank you, sweet Jean, for sharing with Roses of Inspiration. Have a lovely weekend. Hugs! Banana pudding is one of my favorites. I love these photos, too! Looks like the perfect pan to make Udon! Our most used pan is our Le Creuset 2-in-1 cast iron pan. I know I'd love to try their stainless steel. Thank you, Stephanie! I love a pretty dessert.
. Denise, thank you. I had to really work to get those photos as it was a dark day with lots of lighting issues. 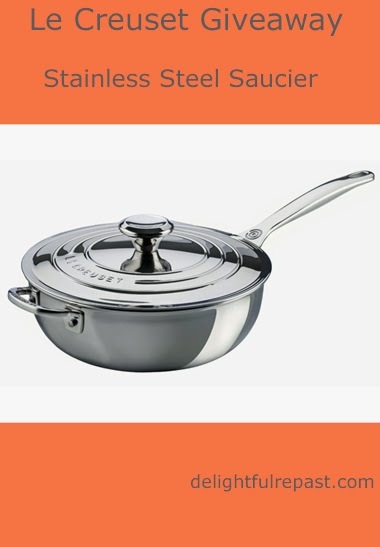 Elisa, it is my favorite stainless steel pan. My favorite Le Creuset enameled cast iron pan is the 5.5-quart round French oven, a real workhorse in the kitchen. My husband LOVES banana pudding! He hasn't had it in a while...I think this would make a great treat for him. As for the giveaway, I would probably make my cheese sauce in it. 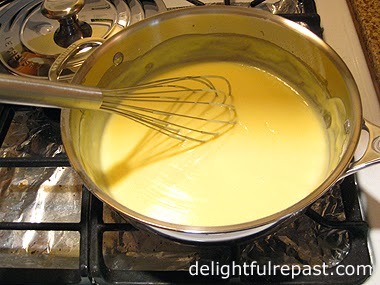 Home Cooking Memories, I can tell you it works great for cheese sauce! The first thing I'll make in it is asparagus risotto. Kristen, it IS asparagus season! Wow - it took 5 minutes just to scroll down the comment column! Ha! The banana pudding looks like pure comfort! So glad you shared. Bernideen, thank you! If only I had so many comments on *every* post! I follow Le Creuset on Twitter, thanks for the giveaway. I follow Delightful Repast on Twitter. My Twitter name is @MOkruhlik. Thanks for the giveaway. Carolsue, coconut curry rice sounds wonderful! Ashley, do let me know how you like it! I think you'll be amazed at the flavor! I would make parmesan couscous or chicken gravy for chicken and biscuits first. Carla, gravy is my favorite food group! The first thing I would make is Summer Lemon-Vegetable Risotto. I think that store bought pudding is too sweet as well. This looks absolutely delicious and I just happen to have some ripe bananas that need to be used. I love anything with bananas! Thanks for sharing the recipe and offer this fabulous giveaway. Jann, I hope you'll like it as much as we do. It always gets raves; no one ever says it isn't sweet enough! What a fabulous banana pudding, Jean! This is the perfect comfort dessert, isn't it? Oh, what a lovely giveaway!! If I won, The first thing I would make would be a roux for my eggs a la goldenrod. I have only one Le Crueset, and it's a Dutch oven and I LOVE it, but a saucier would be fabulous!!! I follow your blog, but I'm not on Twitter. Thanks for the opportunity to win and it's so nice of Le Crueset, too. Kitty, thank you. I've never had eggs a la goldenrod, but I bet I'd like it! Oh how your recipe reminds me of my childhood. 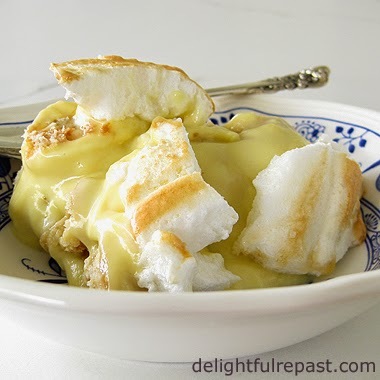 My mother regularly made banana pudding with meringue. I can almost smell it. Sadly, I've never made this old fashioned kind, but if I won I'd definitely make this recipe. In fact, even if I don't win I'm going to make it! Annette, thank you. And I'm glad it brought back a sweet childhood memory! This looks delicious! I would make this recipe in the saucier first. I made another version of a banana cream pie for my husband's birthday last year and I thought that it was a bit too sweet. This looks perfect and his birthday is quickly approaching again! I follow @lecreuset on Twitter (@runsteelsprings). I would make a bechamel sauce to go with croque monsieur! Steel Springs, I hope he'll like the pudding as much as my husband does! Susan, I haven't had one of those sandwiches in years -- thanks for the reminder! This dessert looks wonderful! I'm with you, many desserts are sweeter than they need to be. Thanks for sharing the recipe and the giveaway. The pudding looks great! If I won, I'd make would be an ice cream base since it's getting warmer! Michele, yep! I'll be making plenty of that starting real soon! Banana Pudding is one of my favorites and this looks heavenly! Hope you are having a great day and thanks so much for sharing with Full Plate Thursday this week. Miz Helen, thank you so much! I like the pie that looked so good. Diane, I love homemade chocolate pudding! Tina, I always enjoyed cooking for my dad. I would make my grandmothers chocolate pudding which is a family favorite. I'm so happy to hear that -- I love making my grandmothers' recipes! The first thing I would make would be a risotto. Mmm ... I was just daydreaming about a risotto, Sam! I would make sautéed veggies to top a fresh salad with. I think a asparagus risotto would be my first meal. I just LOVE banana pudding! I've never made it myself, I always waited for my grandmother to make it for me but she passed a few years ago so maybe I should treat myself to your recipe. Looks delicious! Jacquie, great -- the curved sides make that really easy! Rita, I love asparagus risotto! Richard, I do hope you will try it! You need to carry on the banana pudding tradition! Let me know how it turns out for you. I think the first thing I would make in it is a small batch of broccoli, cheese, rice and chicken. I have been wanting some lately. Linda, that sounds so good! Jean, I love that pan too! My fave for jams as well as sauces. Crystal and Anonymous, those sound like delicious dishes for summer! Colette, I can't wait to make some jams in it over the next few months! I didn't have it in time for my annual marmalade making. What I'd make in this saucier? Something saucier than saucy, of course! All best from your Twitter friend Shelley Frisch.
. Shelley, nice to hear from you! I would make spaghetti sauce. Julie, good idea, one I haven't tried yet! Your banana pudding looks fantastic! Thanks for visiting my blog today! I would make risotto in this pan. I adore homemade puddings, Jean and your Banana Pudding is simply gorgeous. I love how you have used the meringue as well. Great giveaway - I can't enter as I live in the UK but I must say, Le Creuset are my absolute favourite! Thank you for sharing with us at the Hearth and Soul hop. The volume of this sauce pan is equal to a 9X13 container. And, because of the slope of the sides of the pan, I would make (dairy-less) risotto. 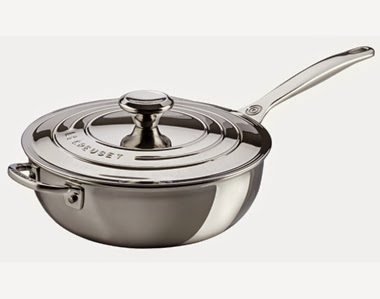 *Giveaway Winner Announced* - The winner, by random drawing, of the Le Creuset stainless steel 3.5-quart saucier is Leslie. Leslie, as soon as you send me, delightfulrepast at aol dot com, your name, address and phone number (required by shipper), Le Creuset will ship the pan to you. Congratulations! If I don't hear from the winner of the random drawing by 11:59 am Eastern time Sunday, May 24, another drawing will be held and a new winner selected from among the original entrants (those who commented before the giveaway deadline). Nicki, so sorry your entries came in past the entry deadline. I do hope you'll get in on my next giveaway. Not sure when or what it will be, but you can be sure it will be something wonderful for the kitchen! Hi, Rusthawk. Nope, Leslie is happily awaiting her new pan! Haven't decided what I'll be giving away next, but stay tuned. 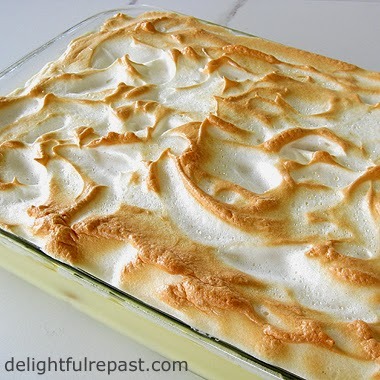 I love lemon meringue pie and banana pudding, and your pan looks fantastic! The presentations are gorgeous. Thank you so much for sharing. Linda, thanks! And I love your gravatar (I'm a cat lover)! Oh my gosh! I missed this post. I'm sure I would have won LOL! You might have, Pat! Make sure you don't miss any of my posts, as I do giveaways several times a year. You never know when, but you know it's going to be something great!